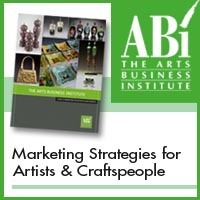 If you want to these last 5 months of the year more successful than first at your shows, in your wholesale shops, and online, you’ll want to check out the new e-course, Guide to Marketing for Artists & Craftspeople by the Arts Business Institute. This 7-module course covers every aspect of marketing and will teach you how to find (and connect) with your audience and how to incorporate persuasion triggers to encourage customers to buy. Claim to Fame: Since 2002 the Arts Business Institute has been helping artists and craftspeople learn how to run successful businesses. Their blog is full of amazing advice. This course covered every aspect of marketing in easy terms with in-depth videos and a slew of worksheets. We really loved how the modules were broken down into small chapters capped by a self-evaluation worksheet so that you could squeeze one chapter in daily on your mid-day break. The modules discuss different pricing strategies, how to convey the value of your work to your target audience, how to create a budget for marketing, and the best ways to design a press kit for maximum acceptance by editors. Unlike most courses we review, this one was created by an entire institute of artists and crafters. That’s why it covers all aspects of marketing, from websites to direct mailings to trade shows. If you’ve been wanting to break into the arts and craft world as the next Chihuly or ‘Painter of Light’, this course is the perfect resource because it’s specifically tailored for you. The Arts Business Institute dedicated an entire module to ‘The Psychology of Marketing’. They identified the five persuasion triggers you should take advantage of to eliminate obstacles your customer has about buying from you. They show you how to utilize the power of scarcity and social proof to create a stronger desire for customers to become a repeat buyers and raving fans. We’ve heard of such triggers before but this is the first time we’ve really seen them explained so thoroughly. Plus, they give you worksheets to figure out how to incorporate the triggers into your marketing. So if you’re ready to up your marketing game with the knowledge of a whole institute of artists and crafters, you’ll want to check out the Guide to Marketing for Artists and Craftspeople. It really is a fully comprehensive guide that will have you marketing and networking like a pro.